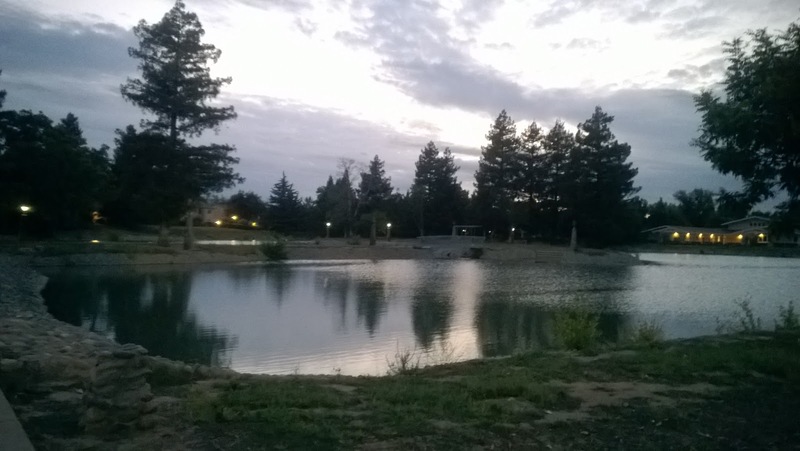 Ellis Lake is one of the most recognizable and historical areas in the city of Marysville. The lake was once a swamp before it was converted into a park in the 1930s. Pictures from the "golden days" of Ellis Lake can be found online and they show a very different lake than the one we have today. Some interesting I found about Ellis Lake from way back then. 1. You use to be able to swim in it. 2. There use to be plants along the banks, mostly lilies. 3. The water use to be pumped from the Yuba River. It is a shame that the lake is in the condition that it is in now. Dead bodies, hostile geese, transients, druggies, and stagnant water. All the stories and rumors are true. Despite all the negativity about Ellis Lake, I still think it's a great fishery that offers a lot more than what meets the eyes. As a native Marysvillian I grew up fishing the lake since I was a kid. The lake had and still has a lot of bluegills that are very easy to catch and that was all we ever fished for. Simple, easy, and fun. 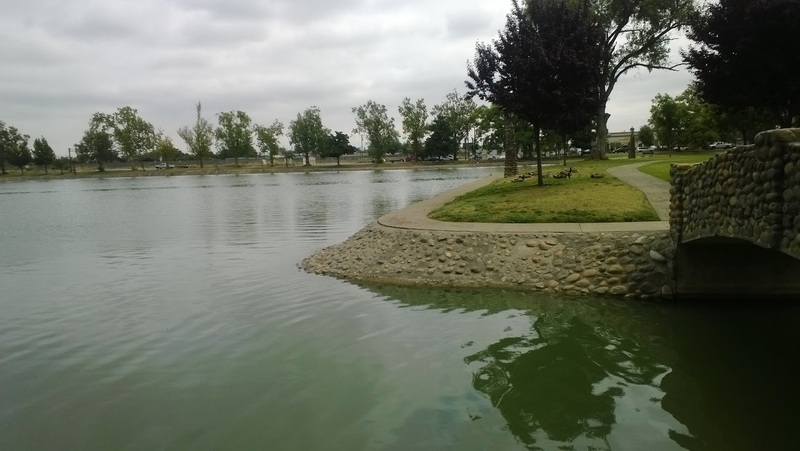 The lake was A LOT nicer back then with green grass that you could lay in, cleaner sidewalks, and somewhat cleaner water. Now that I am an avid fly fishermen back in my hometown, Ellis Lake is going to be my new equivalent of Horseshoe Lake. The fishing at Ellis Lake is easy but can be very tricky at times for certain species. There are several warm-water species, largemouth bass, bluegill/sunfish, carp, catfish, and crappie in the lake as well as a few exotic pet releases like koi and oscars. 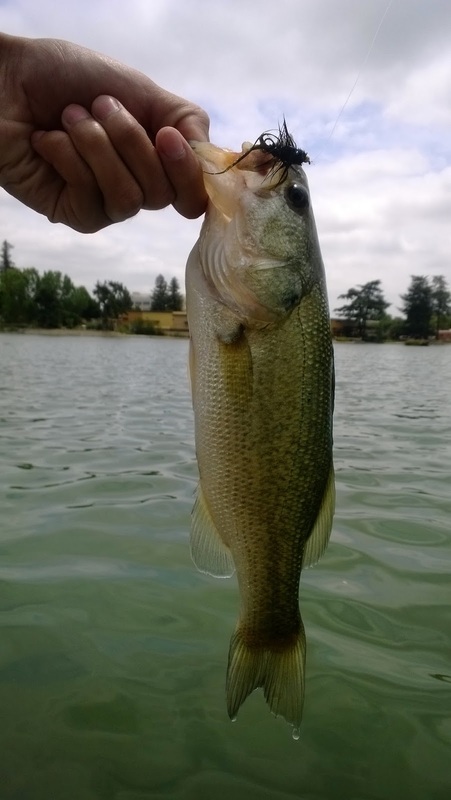 The largemouth bass in the lake get constantly pressured throughout the year so the big ones are wise and finicky. The biggest bass I've ever seen in the lake was a female around 6-7#s during the spawn however I've never seen or heard of anyone catching a bass bigger than 4-5#s out of Ellis. Typical streamer patterns work well and occasionally terrestrial dries like damsels for top water action. The bluegills are the most common catch on the lake. They are all over the place and like to hold near the rocky concrete banks below the sidewalks. The bluegills don't get huge but they are abundant. Sometimes if you jig the fly next to the rocky walls of the bank the bluegills will grab it and snag you by dragging the fly to where they were hiding. Hilarious. Channel catfish are released into the lake during the annual fishing derby. 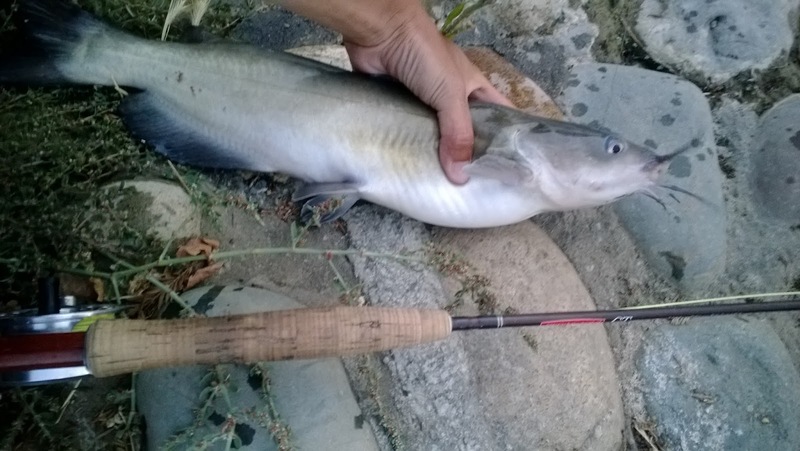 These fish are your standard size catfish near 2-5#s. I usually catch them on buggers and clousers. Though these fish are great to fun to fish for, the annual derby stocking tends to shuts down the fishing at Ellis for a long time due to the heavy pressure. Crappies are a frequent catch from time to time. I've seen a few big crappies chase my fly but I've only landed a handful of smaller fish. They are out there though. 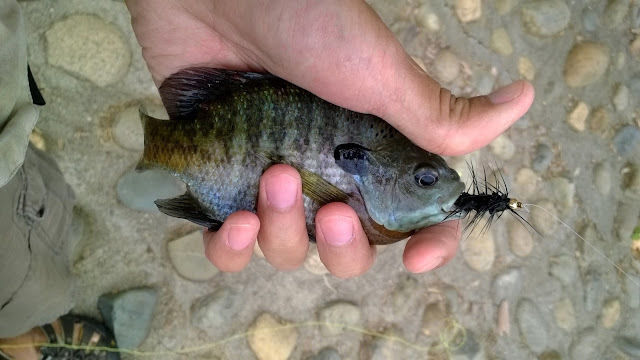 These fish really like clousers but will hit anything if they are on the bite. Ellis Lake also has a good population of carp. Everyone blames the carp in the lake for the poor water quality but I believe they are wrong. These carp get pretty big about 5-15#s. They can't really be fished for with a fly unless they are cruising below the film eating from the top. The water is actually cleaner than people make it out to be. Think about Ellis Lake versus the Sutter Bypass. The bypass water is full of chemicals and residue from the agriculture in the surrounding areas whereas Ellis is just dirty and gross. I personally wouldn't eat anything out of either body of water but there aren't any rules against it. One of the best things about the lake is its accessibility. Anglers can walk the entire lake and cover as much water as their heart desires. You can easily cover the entire lake within a few hours searching every nook and cranny for a bite. When I cover water at Ellis Lake I cover it like steelhead. Cast about 20ft in, retrieve, and take two steps. I'm a bit of a slow poke compared to the gear guys but it pays off. The weather was unusually cool this visit which was good but it was very windy which was bad. My go to rod for Ellis Lake is a 3WT. Just enough to make every fish I hook into a fun time from a 3'' bluegill to a 15# carp. Today I caught every species that swims in the lake with the exception of a carp. People watched as I fought a nice catfish on my 3WT. My reel was screaming! Not the biggest fish I've landed but a lot of fun. It's very hard to get skunked at Ellis Lake if your using a fly rod. I am currently working on creating patterns that work well and will hopefully catch me an Ellis Lake trophy someday. Here's to a nice, accessible, and fun to fish lake! ive always got skunked at ellis. i was fishing last night at about 6:30, the second the sun went down i seen fish feeding on flys everywhere! the wouldn't touch my lure. what fly gear do you recommend? ive never fly fished, but i am going to give it a shot tonight. 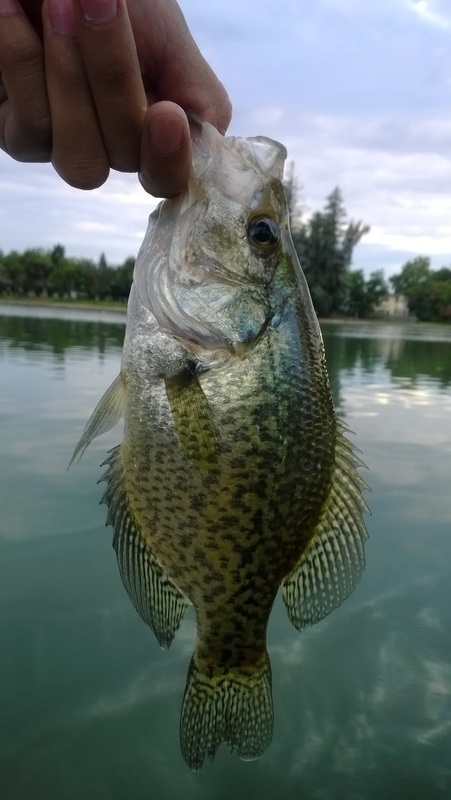 This time of year I catch a lot of small crappie near the banks. I use a small chartreuse/white clouser minnow. For stuff on top I would use a size 14 ot 16 adams. I don't know what they are feeding on top right now but I'm sure any small buggy fly would work.